(Phys.org)—A trio of researchers with the University of New England, Curtin University and the University of Western Australia has discovered how echidnas manage to survive brush fires. In their paper published in Proceedings of the Royal Society B, Julia Nowack, Christine Elizabeth Cooper and Fritz Geiser describe their study of the animals after a part of a nature preserve was deliberately set on fire to help fire-dependent vegetation become established. 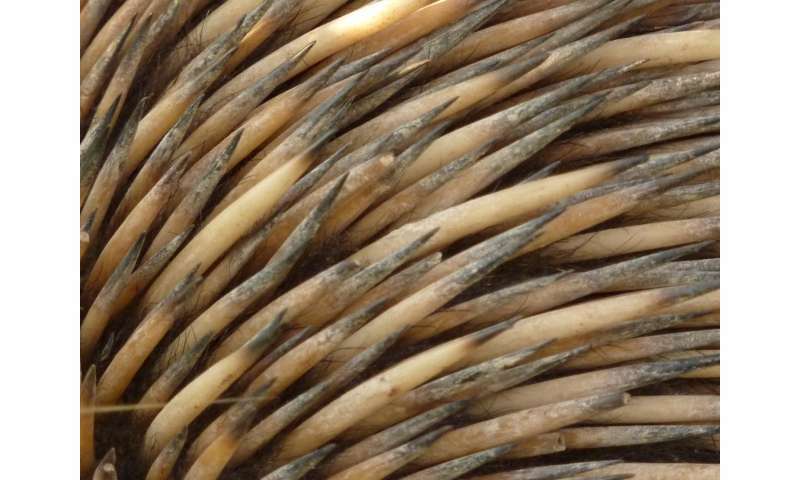 Scientists have known for quite some time that echidnas, an egg laying mammal related to the platypus, are able to survive not just brush fires, but the aftermath when there is little to no food and sometimes a limited amount of breathable air. To learn more, they conducted a study of several of the animals that were living in Dryandra Woodland, southeast of Perth in Western Australia—many already had tracking devices that allowed for study of their movements. Managers of the preserve had decided to conduct a controlled burn in the area to make parts of the preserve more open to new types of vegetation, helping them to gain a stronghold. As the fire burned, the team monitored the activities of the echidnas, and continued to do so for several days thereafter. Though they were not able to positively identify the means by which the animals avoided being burned, they did find evidence that suggested that they likely holed up in logs thick enough to protect them. But it was their activity in the weeks after the fires had passed that was most interesting—the animals did not roam looking for food, instead they put themselves in and out of a torpid state, sometimes for as long as four days. The torpid state, the team explains, is similar to hibernation in other animals—they go into a deep sleep and their metabolism slows down. This allows them to drastically reduce their need for food and water, in essence, allowing them to wait for the smoke to clear and for food to become available once again. The researchers suggest the response to fire by the echidnas might serve as a model for how some mammals managed to survive a strike by an ancient asteroid millions of years ago, wiping out the dinosaurs—by going in and out of torpid states allowing them to last a long time on very little nourishment. Fires have occurred throughout history, including those associated with the meteoroid impact at the Cretaceous–Palaeogene (K–Pg) boundary that eliminated many vertebrate species. 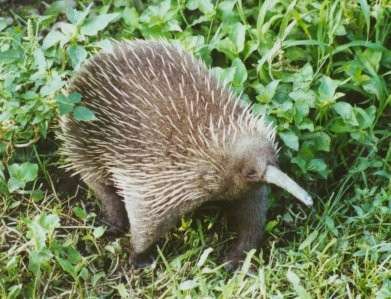 To evaluate the recent hypothesis that the survival of the K–Pg fires by ancestral mammals was dependent on their ability to use energy-conserving torpor, we studied body temperature fluctuations and activity of an egg-laying mammal, the echidna (Tachyglossus aculeatus), often considered to be a 'living fossil', before, during and after a prescribed burn. All but one study animal survived the fire in the prescribed burn area and echidnas remained inactive during the day(s) following the fire and substantially reduced body temperature during bouts of torpor. For weeks after the fire, all individuals remained in their original territories and compensated for changes in their habitat with a decrease in mean body temperature and activity. Our data suggest that heterothermy enables mammals to outlast the conditions during and after a fire by reducing energy expenditure, permitting periods of extended inactivity. Therefore, torpor facilitates survival in a fire-scorched landscape and consequently may have been of functional significance for mammalian survival at the K–Pg boundary. They're actually better with some flame searing regardless is it's the ones with salsa verde or salsa roja. Not such a useful technique with the suizas variety though. You starting a cooking show or somethin'?